Belfast is the capital of Ulster in Ireland. Second city after Dublin, it lies at the end of a deep inlet in the north east of the island. In Belfast, among other peculiarities, the Titanic was built in what was one of the largest shipyards in the world, the Harland and Wolff. Belfast is a beautiful city, divided between culture and industry, full of interesting monuments and very lively, with dozens of clubs in all districts. In the centre of the town there is the City Hall - the city's symbol monument: in the whole area, clubs and restaurants are excellent. Belfast is notorious for the battles between Catholics and Protestants that have caused many deaths and periods of great stress. Today the situation has markedly improved, the 'wars' between the factions are mainly fought on murals that are a bit' everywhere throughout the city and surely deserve to be admired: the most famous are those in Shankill Road and Falls Road. Belfast is served by two airports, George Best Belfast City Airport and Belfast International Airport. In recent decades, the city has undergone profound changes and restructuring, especially in the areas of Victoria Square, Titanic Quarter and Laganside. Large buildings have sprung up everywhere, such as the Odyssey and Waterfront Hall. The city's cultural life revolves mainly around its universities, Queen's University Belfast and the University of Ulster, and the neighborhood of artists, the Cathedral Quarter. In these areas there are the most interesting and frequented art galleries, boutiques and restaurants in the city. The not to be missed monuments, buildings and tourist attractions are: the above mentioned City Hall, the beautiful Linen Hall Library, the Custom House in Corinthian style on High Street, the Grand Opera House, the Botanical Gardens near the Queens University, St. Anne's Cathedral, the Crown Liquor Saloon, the Ulster Folk & Transport Museum, the W5 Discovery Centre, the Odyssey - very suitable for children and the zoo in Cave Hill. 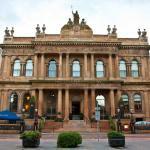 The exclusive Fitzwilliam Hotel Belfast is located in a very convenient location in the heart of Belfast, right on Great Victoria Street, not far from the Grand Opera House and the central station of the city. 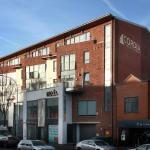 Cordia Serviced Apartments is located not far from the centre of Belfast, the bus station and the train station. This hotel offers free parking and easy access to shops, restaurants and bars. 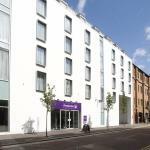 The Ramada Encore Belfast City Centre is located in the central area of ​​Belfast Cathedral, not far from the shopping area. The M2 motorway, within easy reach, provides fast travelings. 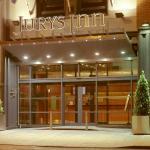 A few steps away from the major attractions of the city and next to the Opera and the City, you will find the Jurys Inn Belfast. 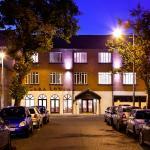 It offers 24-hour reception and a public car park near the hotel.